The following is a guideline as to when a Cure Period Notice would be deemed applicable, when using the 2017 AAR Residential Resale Purchase Contract. 1c 19 Buyer to supply Letter of Credit or Source of Funds. Seller may cure if Proof of Funds are not supplied. 1d 29 Buyer to deposit closing funds by scheduled COE. Seller may cure if funds are not deposited. 1f 36-38 Required Addenda Incorporated into contract. 1g 55-62 Additional existing personal property included in the sale. 2a 69 If Buyer is obtaining a new loan, the AAR Pre-Qualification Form is attached to the contract. 73-75 Buyer to sign loan documents 3 days prior to COE or will deliver notice of loan approval without PTD conditions and date of receipt of CD from Lender or deliver to Seller inability to obtain loan approval without PTD conditions. 2e 87-89 Buyer to deliver to Seller the LSU within 10 days of contract acceptance. 2f 90-92 Buyer to provide Lender with name, income, ssn, premises address, estimated value of premises, loan amount sought and authorization to run credit. 2g 93-96 Buyer to provide to Lender notice of intent to proceed, or provide documents listed in LSU, lines 32-35. 4a 154-156 Seller to deliver to Buyer a completed AAR Residential SPDS form within 3 days of contract acceptance. 4b 157-161 Seller to deliver to Buyer a written 5 year insurance claims history (or a claims history for period of time that the Seller has owned property if Seller has owned property for less than 5 years) within 5 days of contract acceptance. 4d 175-178 Seller to deliver Lead Based Paint Disclosure within 5 days of contract acceptance. 6a 213-224 Buyer shall conduct necessary inspections within 10 days (inspection period days may differ based on contract negotiation) of contract acceptance. 6j 260-263 Buyer to deliver to Seller a signed notice of items disapproved. 274-284 Seller to respond to Buyer of items disapproved. 1c 17 Buyer to deposit Earnest Money with Escrow Company. 2f 90-92 Buyer to grant Lender permission to access Credit Report. 4a 154-156 Seller to deliver SPDS. 4b 157-161 Seller to deliver Insurance Claims History. 2g 93-96 Buyer to receive Loan Estimate. 2e 87-89 Buyer to supply LSU. 6j 264-272 Buyer to provide notice of any items disapproved. 4b 157-161 Buyer to provide notice of any items disapproved in Insurance Claims History. 6a 213-224 Buyer to order Termite or Insect Inspection. 6i 260-263 Buyer to deliver Inspection Notice. 6j 275-277 Seller to deliver response to Buyer’s inspection notice. 6j 281-284 Buyer to deliver reply to Seller’s Inspection Notice response. 2g 93-94 Buyer to provide lender with notice of intent to proceed. 2g 94-96 Buyer to provide lender with all requested signed disclosures and documentation. 2b 70-75 Buyer to sign loan documents or deliver notice of loan approval without PTD conditions or deliver notice of inability to obtain loan approval. 1d 29-30 Buyer to have funds in Escrow to allow COE on COE date. 6j 278-280 Seller to complete repairs/receipts to Buyer. 8h 409-410 24 hour calendar days beginning at 12:00am ending at 11:59pm. 8i 411-415 Day notice delivered does not count. Clock starts at 12:01 next day & last day of the period is included. 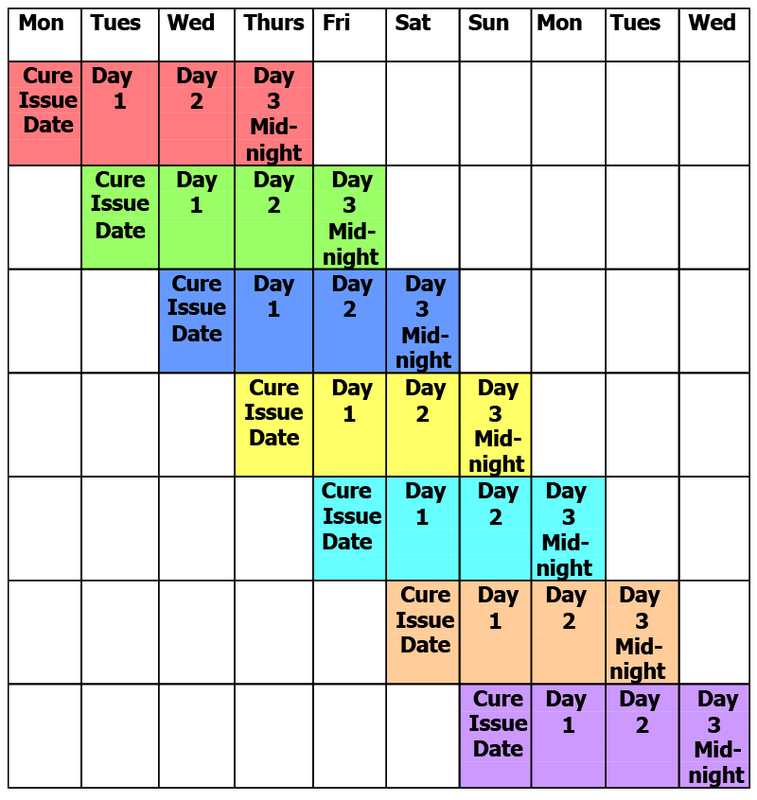 Section 8h, lines 409-410 and Section 8i, lines 411-415 provide a Cure period calculation to be a 24-hour calendar day and the date of delivery notice does not count as the first day. The clock starts 12:01 a.m. next day after delivery. The last day of the period is included and ends at 11:59 p.m.
* Date that Signed Cure Period Notice is delivered to breaching party. If Close of Escrow (COE) falls on a day when the Title Company and/or Recorder’s Office is closed, COE will be on the next day both are open. If breaching party does not cure breach within three days, Yavapai Title Agency would then require a written instruction the following day from the non-breaching party to cancel the contract.